Sen. Kirsten Gillibrand (D., N.Y.) canceled a campaign event in South Carolina less than 30 minutes before it was set to begin. The Democratic presidential candidate was supposed to meet with South Carolina State University students. "JUST IN: Literally 27 minutes before it was set to begin, [Gillibrand's] campaign sends out notice her event here at SCSTATE1896 has been canceled," Associated Press reporter Meg Kinnard tweeted. In tweets that have now been deleted, Kinnard further criticized the Gillibrand campaign. 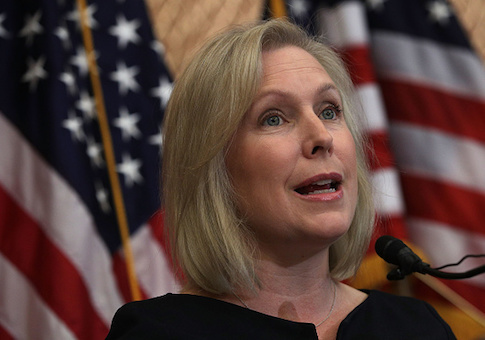 "This comes as no real surprise to me, because @SenGillibrand's campaign strategy has stood in stark contrast to other candidates," she wrote. "Mainly in that she doesn't seem to have one." "Here's hoping, for her sake, that she is able to make some solid hires," she wrote. "At this point, the others who've campaigned in SC are lightyears ahead in organization and communication." "This is a continuation of an entire week of chaotic planning. I've never seen anything like it." The New York Democrat apologized for holding "callous" views on immigration during an appearance on MSNBC's "The Rachel Maddow Show." She said she was "embarrassed" and "ashamed" about her past views on immigration and gun rights during an appearance on CBS's "60 Minutes." She told CNN's Jake Tapper she "did not think about suffering in other people's lives," when asked about past immigration stances. Gillibrand was also criticized for misleading voters about her presidential ambitions during her Senate campaign last year. The editorial boards of the Syracuse Post-Standard and the Buffalo News rebuked the senator, with the latter saying she "flat-out lied." This entry was posted in Politics and tagged 2020 Election, Kirsten Gillibrand, South Carolina. Bookmark the permalink.